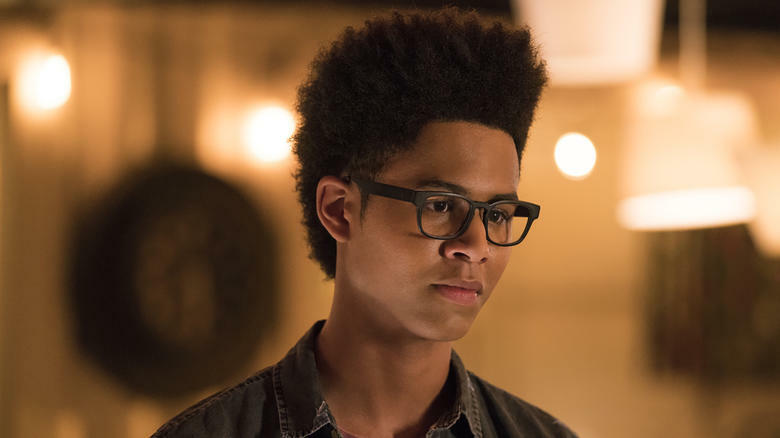 The 'Marvel's Runaways' star on Alex moving past heartbreak and more in Season 2, debuting December 21 on Hulu. Marvel.com: He’s on the run with his friends, but for Alex in particular, what are his personal goals this season? Rhenzy Feliz: Definitely at the beginning it’s scavenging, trying to find food, trying to find a place to live. And it’s always to clear his name but it’s to get his parents ultimately. That’s what they set out to do the whole first season and that’s what they’re going to try to do the second. He has a strong sense for right and wrong and he knows when justice should be served and he knows that if you kill 16 innocent people, you shouldn’t be walking around the streets get praised for it. So that’s going to be one of his main goals for sure. Marvel.com: Alex was left with a bit of a broken heart in Season 2. How is he dealing with all of that in the midst of this? Rhenzy Feliz: I’d say a bit of awkwardness is definitely in the air. I think he was definitely heartbroken. He loved this girl and the way it fell out sucked. It was something he was burdened with and she wouldn’t want to know and it’s complicated. You’re walking on eggshells there. But I think he understands that they’re in a relationship and getting to blossom that relationship. He’s giving them that respect and trying to step back from it in a way. Pretty early on, he finds his own route as well in that lane so that’s fun too. Marvel.com: RUNAWAYS comic book fans are excited to see the Hostel in Season 2. What was it like for you guys the first time you walked on that set? Rhenzy Feliz: Oh man, I snuck in the first time. I went in for a fitting and I just snuck on the stage because they told me where it was. It’s amazing. I’ve never seen a set so big. I heard it was the biggest set so far for Marvel TV. So yeah, getting to walk into a two story mansion, straight out of the comics… And even more so when I got to see it, once they color edited it, after they shot it, the playback of it, that looked stellar! It looks great. Marvel.com: He doesn’t have the kind of powers some of his friends do, but Alex does have his intellect. Will we continue to see him use that to help the group this season? Rhenzy Feliz: Definitely. As the action picks up, he also jumps in and proves his worth even more so this time around in terms of how much he can help and how much he can add to the group. Which is fun, because as an actor you want to be able to impact the story and I definitely get to, so I enjoy it.